The more I get to thinking about this years Madden I think I get more worried. I am, by no means, a Madden expert. I hadn't picked up a Madden title between the years of 1994 and 2008. That's a pretty good - long time. 2008 was terrible. Even for a casual player, like myself. Fumbles everywhere. Fancy menus, but no features. It was strange. Last year I picked up the 20th anniversary edition. I was impressed with it. But still, as many like to mention, STILL behind a game that came out 4 years previous called 2k5. I loved 2k5. For all the folks out there saying it was / is a better game then any Madden, I have to say you are correct. Electronic Arts is Big Business. 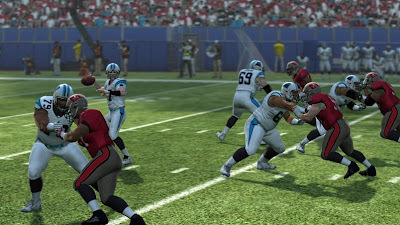 2007 and 08 Madden where HD showcases on a new system. Nothing more. Gameplay was terrible. Last year, I felt that things where dialed in a little bit. It was a pretty good game, but still had some of the frustrating quarks that 08 had. In fact, that almost all Madden's have had. I guess the reason I'm spending the time to write another post on this is that with previous HD versions the Madden hype has been bad. All bad even before the release. But this year? All seems to be good. It's interesting to me to take a moment and record that this is the case. We'll see if the game is up to snuff.